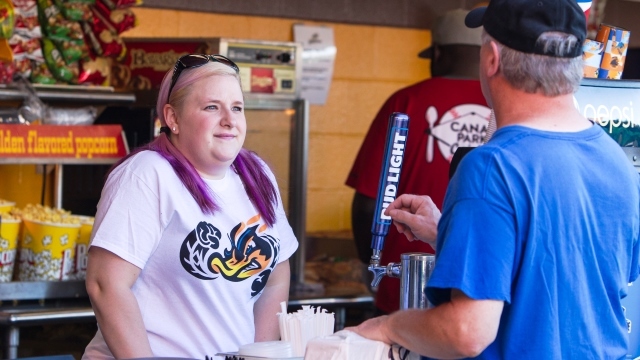 Special food & beverage job fair May 21, 5-7 p.m.
(AKRON, OHIO) May 9, 2018 - The Akron RubberDucks are holding a special job fair Monday, May 21 from 5 p.m. to 7 p.m. in Canal Park's National Interstate Insurance Suite Lobby, to fill out its food and beverage department staffing needs for the busy summer months. The team is seeking energetic, personable people who want to be part of Northeast Ohio's home of Affordable Family Fun. Positions are available both concessions and for The Game Grill + Bar. Available concessions positions include: Bartenders, Cashiers, Cooks, In-Seat Vendors, Runners, and Warehouse; Suites - Bartenders. Available positions in The Game Grill + Bar include: Bartenders, Hosts/Hostesses, and Servers. "We are looking for well-qualified candidates who can help make our food and beverage operations one of the best in the industry," said director of food and beverage Brian Manning. "With Canal Park's game-day atmosphere, these positions are a great opportunity to make some money while having fun at the ballpark." When/Where: Mon., May 21 starting promptly at 5:00 p.m. until 7:00 p.m. Candidates should enter through the Canal Park Main Administrative Office entrance located at 300 South Main Street. Concessions - Bartenders, Cashiers, Cooks, In-Seat Vendors, Runners, and Warehouse; Suites - Bartenders. Prior restaurant experience for The Game Grill + Bar is preferred. Candidates should bring a copy of his or her resume. For more information, candidates can call 330-253-5151 or go to www.akronrubberducks.com.